It’s Monday 26 November and a hunt have gathered at the BA at 10.30. About 20 locals including landowners and followers have gathered as the hunters gradually arrive and install themselves along with the hounds in the car park. The Landlord is heard asking his staff, ‘are you serving them their drinks or standing there chatting’ in his ironic friendly tone and one local greets a rider with ‘it’s always a pleasure and never a chore’. The riders sup a port and are passed a nibble as they also control their horse at the same time. More hooves are heard climbing the hill to the meet and a car arrives packed with country clothing and 2 hounds. There is a quiet chatter as riders welcome each other and ask after each other’s welfare. The hounds are well behaved hanging around the Master’s horse in a small area and not wandering far. The publican offers me a hot mini sausage and more plates of goodies are passed to the riders by the bar staff and gratefully received by the riders on this chilly but dry day. ‘It’s a good turn out’ says one of the regulars. An incomer says ‘those horses are the most beautiful I have ever seen’ and a latecomer arrives to join the gathering on a smaller pony. Another horse leaves its mark on the car park and Ann arrives on a lovely grey but hangs around the outside of the group. She gratefully receives a port but has to cope with her frisky horse. An anxious hound barks his frustration at being curtailed and another rests it’s paws on a cheerful friend, perhaps it’s owner. Ann just manages to grasp a sausage and dip it in the mayonnaise before her horse moves on again. The Landlord offers a veggie option to a rider with a smile on his face. There’s a traffic jam as a vehicle find itself trapped in the narrow lane in front of the pubs. The publican offers me a port and I cannot resist, nor the warm sausage roll from Jenny. It’s about 20 minutes since the first riders arrived and they all seem to be enjoying the second part of the day; the first being saddling the horses and getting dressed up in dark blue jackets and cream trousers with white cravats. The masters of the hounds -3 of them – have red jackets and the hounds remain quiet and obedient under the hooves of the masters horses. A rider takes a second port and Ann’s horse takes another perambulation. A warm spicy skewered piece of chicken is handed round and one of the bar staff ask the publican for more pork. Another van crawls past slowly probably amazed at the wonderful sight. 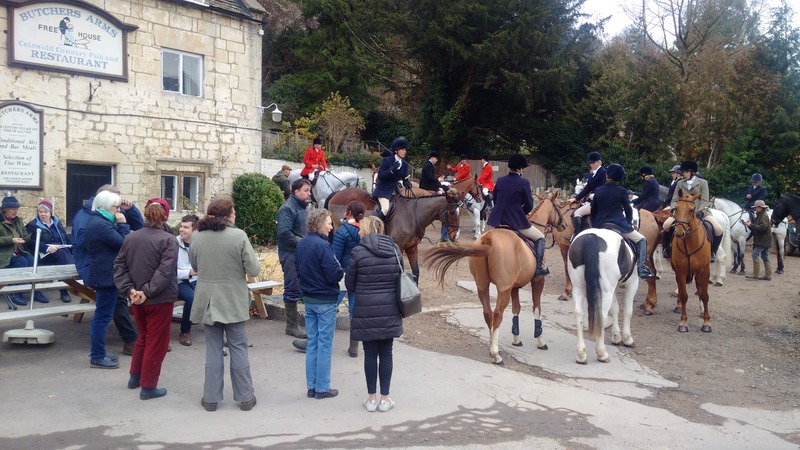 One of the riders, the hunt field master (a woman) addresses the riders and thanks the BA and Mark for their hosting and then they ride off away from the village down the lane towards Painswick with the hounds leading the way. 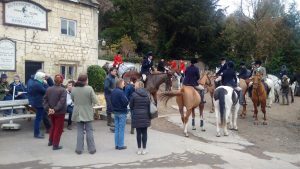 Some hunt supporters, local farmers, spade up the horse droppings and add them to the pub’s flower borders in the car park. The locals stay chatting outside the pub and Rob and the bar staff clear up while bringing out a sandwich as a special order. The pub has clearly begun its lunchtime service an hour or so early and were obviously here early preparing this feast. A couple of open small trucks follow the hunt after clearing the car park presumably to carry out other duties along the hunt such as opening and closing gates. 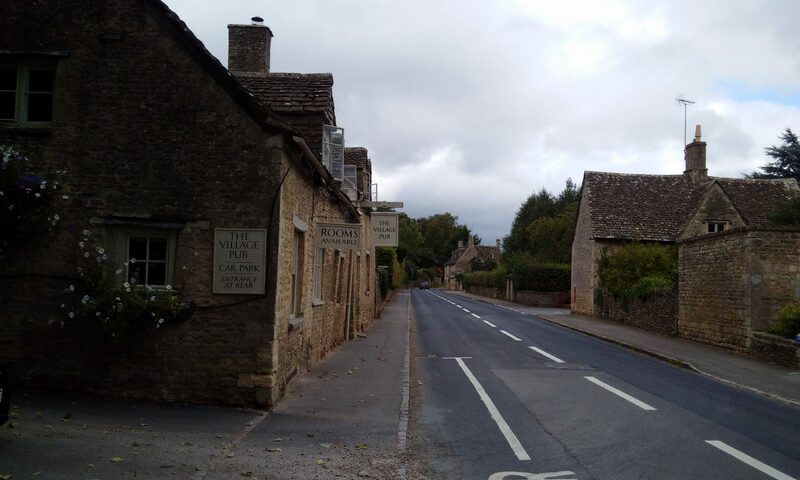 Gradually the locals disperse and the village gets back to its normal quiet Monday activities. It’s all over in less than 45 minutes except for the bar staff who get ready for their busy lunchtime.